The following information and images are part of the presentation slides for the treatment of lymphedema course offered by the Academy of Lymphatic Studies and are reproduced here with the permission of the Academy. For information on what lymphedema is and how it can affect your body, see Lymphedema, part 1. This stage is also known as the sub clinical, pre-stage, or latency stage of lymphedema. In this stage the transport capacity of the lymphatic system is subnormal, yet remains sufficient to manage the (normal) lymphatic loads. However, this situation results in a limited functional reserve of the lymphatic system. Anyone who had a surgery involving the lymphatic system or trauma and DOES NOT develop visible lymphedema, is considered to be in a latency stage (hidden lymphedema). 42% of women present with some degree of visible lymphedema one year post-mastectomy; the other 58% are considered to be in a latency stage. Patients in a pre-stage are “at risk” to develop lymphedema. The reduction in functional reserve results in a fragile balance between the subnormal transport capacity and the lymphatic loads. Any added stress put on the lymphatic system, such as extended heat, or cold, injuries, or infections may cause the onset of lymphedema. This stage, also known as the reversible stage, is characterized by soft tissue pliability without any fibrotic changes. Pitting is easily induced and the swelling retains the indentation produced by the (thumb) pressure for some time. In early stage I, it is possible for the swelling to recede overnight. With proper management in this early stage the patient can expect a reduction of the extremity to a normal size (compared to the uninvolved limb). Without proper care, progression into stage II in the vast majority of the cases is inevitable. 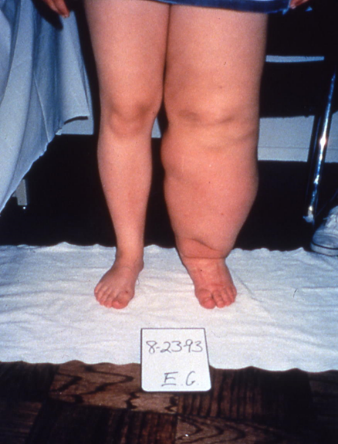 It is difficult to distinguish stage I lymphedema from edemas of other geneses. The clinician needs to rely upon the history and whether the swelling resolves with conventional management (compression, elevation) or not. Stage II, also known as spontaneously irreversible, is primarily identified by tissue proliferation and subsequent fibrosis, also known as lymphostatic fibrosis. Tissue proliferation is caused by long-standing accumulation of protein-rich fluid. Over time the tissue becomes harder, and pitting is difficult to induce. In many cases the volume of the swelling increases, which exacerbates the already compromised local immune defense. Because of this, infections (cellulitis) in this stage are common, which in turn tends to increase the volume of the affected area. 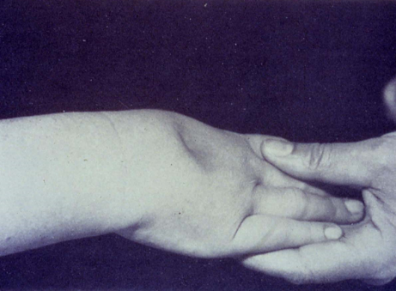 Volume reduction can be expected if proper treatment is initiated in this stage of lymphedema. In most cases, the hardened tissue will not completely recede in the intensive phase of Complete Decongestive Therapy. Reduction of fibrotic tissue is achieved mainly in the second phase of CDT with compression and good patient compliance. Lymphedema often stabilizes in stage II. 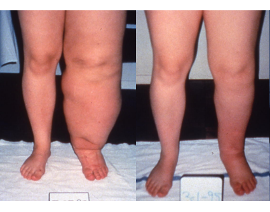 In those patients suffering from recurrent infections, the lymphedema may develop into stage III, lymphostatic elephantiasis. The fluid component in this stage can be removed (spontaneously), while it will take more time to remove the increased tissue component (initially irreversible). Typical for this stage is an increase in volume of the lymphedema, and further progression of the tissue changes. Lymphostatic fibrosis increases in firmness, and other skin alterations, such as papillomas, cysts and fistulas, hyperkeratosis, fungal infections of the nails and skin, and ulcerations develop frequently. Pitting may or may not be present. 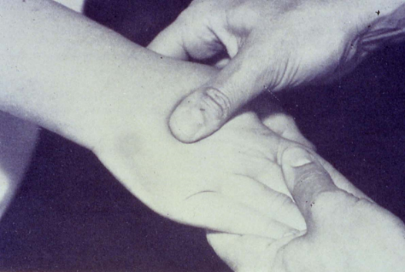 The natural skin folds, especially on the dorsum of the wrist and ankle deepen. In many cases cellulitis is recurrent. If lymphedema management starts in this stage, reduction can still be expected. To achieve good results, it is necessary to extend the duration of the intensive phase of CDT. In many cases the intensive phase has to be repeated several times. Even extreme cases of lymphostatic elephantiasis can be reduced to a normal, or near normal size with proper care and patient compliance. Patient received a series of 40 treatments (four weeks) of Complete Decongestive Therapy. Lymphedema was reduced, but some fibrotic tissue was still present. Right picture shows patient two years after discharge. Due to excellent compliance, the patient was able to reduce the fibrotic tissue considerably. Complete Decongestive Therapy (CDT) is a non-invasive, multi-component approach to effectively treat and manage lymphedema and related conditions.